Hemp Today is a global look at the hemp plant and its derivative industries. 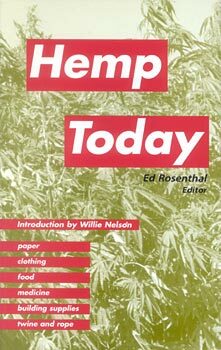 It is the first book to provide current reports on hemp cultivation and products in the 1990's. Hemp Today is written by the world's top hemp experts. Chris Conrad, Lynn Osburn, Mari Kane and Hayo van der Werf are some of the authors offering different perspectives about hemp's uses and prospects. All agree it is a natural resource, helping farmers, business, consumers and the environment. Some proponents go further, claiming hemp is the miracle plant which can save the planet and the economy. Is this true? This book is the first open discussion of the realistic possibilities. Hemp Today looks towards the future, showing what the industry will be like in five years. Every person interested in hemp, the environment, and the economy will be amazed at this plant's potential. "Hemp is a healthy crop which could make the difference between survival of the family farm and its extinction."